5) Navy 45, Tigers 20 (November 7) — Forget the result. This game, ironically, is the snapshot that will stick with me from the Justin Fuente Era in Memphis. The undefeated (8-0) Tigers and the 6-1 Midshipmen met on the gridiron (somehow for the very first time). And 55,000 fans packed the Liberty Bowl without an SEC team in sight. I’ve long held the Liberty Bowl is too big a stadium for the Memphis program. A crowd of 40,000 should not feel like a third of the stadium is empty. But when you pack 55,000 into the old saddle, it feels like big-time college football. Dreams of a New Years’ Six Bowl for the Tigers died on this night. But something else came alive. 4) Dallas 103, Grizzlies 95 (January 19) — The Martin Luther King Day game has become, in my opinion, the top annual event on the Memphis sports calendar. Saluting former athletes for making a difference beyond the box score makes for a poignant event, and one held merely blocks from the National Civil Rights Museum. This was the first chance I had to take my entire family to the game, allowing me the chance to try and explain the significance of Earl Monroe and his connection to one of the NBA’s most memorable teams. (Happily, my daughters were both familiar with another of the Sports Legacy Award honorees: Jason Collins.) This may have been the best matchup in the history of the event, the Griz entering the game with a record of 29-11 and the Mavericks at 28-13. Memphis fell behind by nine after the first quarter, clawed back to finally take the lead with just over four minutes to play, but fell when Dirk Nowitzki hit three field goals over the game’s final two minutes. The real winner, as it is every year on MLK Day, was the city of Memphis. 3) Redbirds 9, Sounds 4 (June 24) — I used some vacation time, took the afternoon off, and enjoyed this Wednesday-afternoon tilt with one of my daughters. Memphis fell behind, 2-0, in the top of the first, but Stephen Piscotty homered on the first pitch he saw in the bottom of the first, making the 109-degree heat index feel like hitters’ fuel. Bartlett native Jacob Wilson later added a double and Tommy Pham a triple as the Redbirds’ offense took starting pitcher Zach Petrick off the hook. Less than a month later, Piscotty made his debut with the St. Louis Cardinals, taking over leftfield from the injured Matt Holliday. Pham also played a key role in the Cards’ 100-win season that earned the franchise a third straight National League Central title. But on this sweltering afternoon at AutoZone Park, the Cardinals’ future was still the Memphis present. 2) Tigers 53, Cincinnati 46 (September 24) — This Thursday-night affair took more than four hours to play . . . but felt like 90 minutes, max. 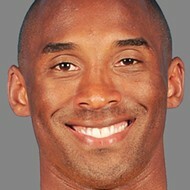 The two teams combined for 1,322 yards of offense (most of them — 752 — by the loser), 12 touchdowns, and 11 lead changes. Cincinnati scored nine times (four field goals) and Memphis eight (one field goal), with the same team scoring consecutively but once (two Bearcat field goals in the second quarter). 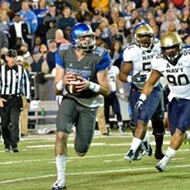 Memphis quarterback Paxton Lynch passed for 412 yards, a career high (until the Tulsa game a month later). Not until Tiger linebacker Leonard Pegues picked off a wobbly Hayden Moore pass with 10 seconds left on the clock did the U of M secure the win. This was the third time in four games Memphis scored at least 50 points in a football game (with two more to come). 1) Tigers 37, Ole Miss 24 (October 17) — The Rebels were visiting the Liberty Bowl for the first time in five years and had beaten mighty Alabama a month earlier. But here’s the thing: The vast majority of the 60,000 fans in the Liberty Bowl . . . were wearing blue. This game certainly represented the apotheosis of the Justin Fuente Era in Memphis. 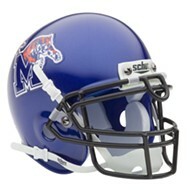 The question should be whether or not it’s the apotheosis of University of Memphis football, period. After falling behind 14 points just six minutes into the game (“Here we go again . . .”), the Tigers simply dominated the 13th-ranked team in the country. 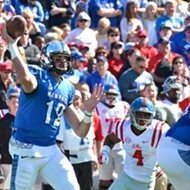 Over the next 30 minutes of playing time, Memphis outscored Ole Miss 31-0, quarterback Paxton Lynch throwing three touchdown passes on his way to a 384-yard game. Two field goals by All-American kicker Jake Elliott provided separation in the fourth quarter. The victory improved Memphis to 6-0 for the first time in 54 years and extended the Tigers’ program-record winning streak to 13 games.